Lack of storage space may prove to be detrimental on keeping track of belongings and important documents as it increases downtime and contributes to clutter. That is why the use of mobile shelving can greatly improve accessibility, productivity and organisation of your workplace. With continuous advancement of the technology used to develop them, the mobile shelving systems of today provide a variety of special features that answer specific needs of the clientele. Read on to know more about their advantages for your business or organisation. Mobile shelving can potentially increase your storage capacity compared to traditional shelves. You can make the most of your current space by gaining 100% storage capacity or by reducing storage footprint by 50%. 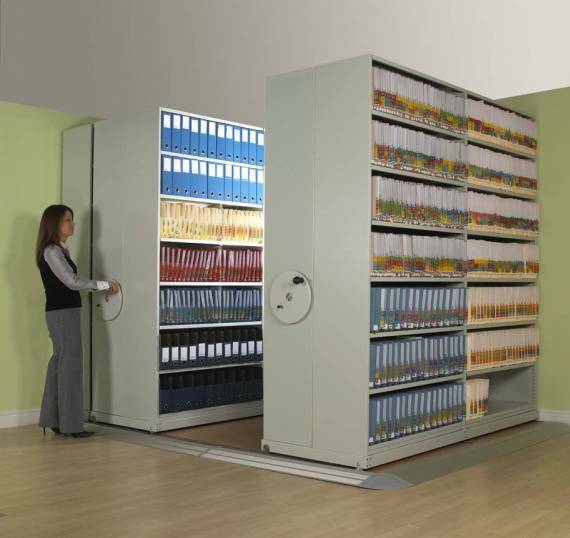 Installing mobile shelving can help you organise your files and materials neatly. This will make it easier for you to find and retrieve stored items quickly, thereby enhancing employee morale and productivity. Roller racking or mobile shelving systems can be modified based on your individual storage needs. If you are either storing bulky boxes or just file folders, mobile shelving is a smart option. Large boxes or heavy loads can be handled by deep shelves and heavy-duty carriages, whilst pre-configured measurements can perfectly store any of your files. Mobile shelving offers great long-term benefits to your business. These provide the highest storage density as compared to traditional shelves, allowing you to plan for short-term or long-term expansion in existing spaces. Any mobile storage system may have a locking device but electric powered mobile shelving can provide you with the best security. Protected by electronic or remote access, it guarantees that only authorised personnel will be able to open the aisles and access the files. This can help reduce theft. Powered mobile shelving systems can remove the potential risk to its operators and its stored items. With these electronic systems, lesser physical efforts will be used, ensuring the safety of the users as well as the stored materials. Compared to a traditional filing cabinet system, mobile shelving can give you more storage in the same space without incurring additional cost. This will give you more floor space that you can use productively. Mobile Shelving Systems are a well-established supplier of mobile shelving units and mobile shelving systems working together with all the major storage equipment manufacturers. We aim to offer both cost-efficient and space efficient storage solutions to our wide client base throughout the whole of the UK and Europe. To discuss your specific storage needs, please call us on 01444 220290.